Our Products >> Design Essentials Natural Honey Curl Forming Custard 8oz. Natural Honey CurlForming Custard with Honey and Chamomile defines, shapes and elongates curls and coils providing lasting hold, without residue for highly defined, frizz-free curls with brilliant shine. Defines Curls Stretches Curls & Coils Adds Shine Reduces Frizz Medium to Firm Hold Ideal for 2-4 Curly & Coily Texture Types. Fight Shrinkage: As much as we love our fabulous curls in their natural state… Let’s be honest, the shrinkage struggle is real when it comes to curly hair and from time-to-time you may just want to switch it up by elongating your curl pattern. When that time calls, try our Natural Honey Curl Forming Custard made with Honey and Chamomile elements that highly defines and stretches frizz-free curls and coils with brilliant shine. Great for wash and go styling, finger coils, two-strand twist-sets, and bantu-knots. Delivers A Medium to Firm Hold: Ideal for curly to tightly coiled textures, our Natural Honey Curl Forming Custard defines, shapes, and elongates curls and coils with an excellent medium to firm hold, without flaky residue. 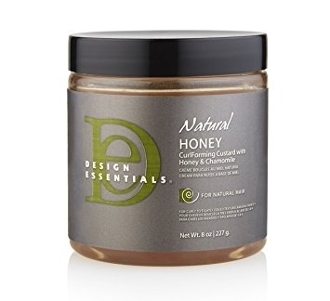 Design Essentials Natural Honey Curl Forming Custard 8oz.